Albert Edward Brumley, Sr. (1905-1977) = Singing School Teacher. Gospel songwriter. Best known for " I Can Hear Them Singing Over There (1927);" "I'll Fly Away (1932);" "If We Never Meet Again (1945);" "They Have a Good Time on Sunday (1951);" and "Turn Your Radio On (1938)." Best guesstimates are that he wrote between 600 to 800 songs in his lifetime. Albert was born near Spiro, Oklahoma to Sarah Isabelle (Williams) and William S. Brumley. He, the middle child of three, grew up in the cotton fields and on the family farm - hoeing, picking cotton, and chopping down the spent plants. It was hard work, but music made life bearable - his father played the fiddle, his older brother played the guitar and he learned to play an instrument too. After completing the tenth grade, between 1926 and 1931, he studied at Eugene Monroe Bartlett's (1884-1941) Hartford Musical Institute in Hartford, Arkansas. He married Goldie Edith Schell (1912-1988) in 1931 and together they raised six children - five bouncing boys and one sweet girl. It is said that Mrs. Goldie was a good encourager and wife for Mr. Albert. He was like Fred MacMurray in the movie "The Absent-Minded Professor" when he was in the zone, writing and creating and Goldie kept him on track. In 1970, Brumley was inducted into the Nashville, Tennessee Songwriters Hall of Fame. He would go on to be inducted into seven more Halls of Fame such as the Gospel Music Hall of Fame and the Oklahoma Music Hall of Fame. Albert was a member of the Fox Church of Christ and was buried in the church cemetery after he passed into glory on the 15th of November 1977. Goldie graduated from earth to heaven ten years later. His work lives on. 1. "Albert E. Brumley, A Living Legend." By Gene Gideon. Albert E. Brumley's All-Day Singin' and Dinner on the Ground. Camdenton, Mo; 1972. Repository: Author's Home Library. 2. Albert E. Brumley's Songs of the Pioneers. Pioneer Song Book, Camdenton, MO. ; 1970. Repository: Author's Home Library. 7. Sing Me Back Home: Southern Roots and Country Music by Bill C. Malone. 2017. Ch. 7. Google Books. 8. "The Gentle Genius." Listening to the Jar Flies: Growing Up in Wheaton and Rocky Comfort. By Jimmy R. Lewis. 2015. Ch. 28. Google Books. Albert's favorite books were a rhyming dictionary and a thesaurus. He also carried a pen and paper with him wherever he went. Thomas Sears Huffaker (1825-1910) = Methodist Missionary. Postmaster. County Commissioner. Probate Judge. Kansas Legislator. Born on March 30 to Catherine (Lowe) and George Smith Huffaker, an ordained minister of the Methodist Episcopal South church in Clay County, Missouri. Eliza Ann Baker was born in Illinois to Agnes (Inghram) & blacksmith, Joshua W. Baker in 1836, raised in Iowa and married Thomas on 6 May, 1852 at the age of 16 in Council Grove by a missionary traveling to Mexico, one Rev. Nicholson. Previous to their marriage, in 1850, Thomas was sent to Council Grove, Morris County, Kansas as a missionary to teach the Indian children by the Methodist Episcopal South Board of Missions after he taught at the Shawnee Manual Training School in Johnson County for two years. Few Indians allowed their children to attend the Kaw mission school, so the mission closed within a few years. After awhile, when settlers began to settle around and in Council Grove, he taught the children of those settlers and began a Sunday School there. In addition to teaching, he engaged in a mercantile business, farming and raising farm stock. They lived at the mission until a new fourteen room house was built for their family, eventually numbering twelve members, one quarter mile north of the mission. Thomas and Eliza celebrated their fifty-third anniversary there. After her father passed, a daughter, Anna Carpenter, sold her home on Second Street and moved to the mission in 1911 with her mother (1836-1920), living there until her death in 1921. Both Thomas and Eliza were buried in the Greenwood Cemetery in Council Grove, Kansas. 1. Some Boone Descendants and Kindred of the St. Charles District. By Lilian Hays Oliver. Chedwato Service, 1964. p. 267-270. 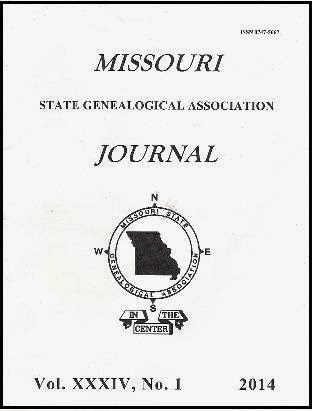 Repository: Midwest Genealogy Center, Independence, MO. 3. History of the State of Kansas. By William G. Cutler. A. T. Andreas, Chicago, IL, 1883. p. 805-806. Repository: Google Books. 5. "Homer Huffaker." A Standard History of Oklahoma. by Joseph Bradfield Thobum. Vol. 5. p.2133-34. Repository: Google Books. 6. Photo of the Kaw Mission in Council Grove, Kansas. Kansas Memory. 1. Santa Fe Trail Historic Markers from Independence, MO to Council Grove, KS. 2. Shawnee Indian Mission Historic Site & Museum, 3403 W. 53rd, Fairway, KS. 3. Kaw Mission State Historic Site, 500 North Mission, Council Grove, KS. Dr. James Naismith (1861-1939) = Presbyterian Minister. Physician. Professor. Best known as the Inventor of Basketball. Born in Canada to John & Margaret (Young) Naismith who passed away when he was but eight or nine, he was raised by his grandparents and an uncle. He attended courses at both the Presbyterian College and McGill University in Montreal, Canada and from there, in 1890 he entered the School for Christian Workers college in Springfield, Massachusetts. It was there that James Naismith came up with the new game. He was inspired by a Canadian game he played as a child, but instead of using rocks, he created his game to be played with a soccer ball and two peach baskets. From Springfield, Naismith went to Denver where he finally acquired a medical degree at the Gross Medical College in 1898 and later, in the same year, he joined the University of Kansas faculty at Lawrence, Kansas. He initiated the first collegiate Jayhawks basketball game at the University. Following the 1936 Olympics, he was offered thousands of dollars for endorsements of various tobacco products, which he rejected on principle -- tobacco was harmful to young people. James was a papa to several children and a happy husband. He remained at Lawrence until his death in 1939. 1. Basketball: Its Origin and Development. By James Naismith. University of Nebraska Press, Lincoln, NE; 1996. Lee Mace (1927-1985) - Entertainer. Bass String musician. Best known for Lee Mace's Ozark Opry. Born to Lucian Thomas and Anna Jane "Clare" (Buster) Mace on a summer day (30 July) near Brumley, Missouri, almost a year after his parent's marriage on 8 Aug 1926. He was the oldest of three children. Lee grew up in Tuscumbia, Missouri in the quarters above the jail when his dad, Lucian, was elected Sheriff (1940s). Lee's dad was later elected to the Missouri House of Representatives and served as both a Judge and a school teacher. His mother wrote a column for the local paper. She, a Baptist, adopted a Bible verse (Philippians 4:8-9) that was her philosophy of life. Lee received a shiny red Western Flyer bicycle one year for Christmas and a new baby sister. He graduated from Tuscumbia High School in 1945 and then served in the Navy during the last part of WWII and in the Army during the Korean Conflict. Lee married Joyce Williams on 16 Aug 1950. Three years later, Lee founded his Ozark Opry. He got some folks together from the area and began putting on hillbilly music shows. His wholesome, family shows grew so much that he built a new auditorium in 1957 with a seating capacity that eventually reached 1000 seats. They performed from mid-April to mid-October every night except Sundays as well as a half-hour show on television by 1966 which aired in the central Missouri region. Lee died in a private plane crash on 16 June of 1985. Joyce continued running the show until she retired in 2005. Lee is buried in the Gott cemetery in Ulman. Look for the big bass fiddle carved on Lee's tombstone. 5. The Story of Lee Mace by Joe Pryor, former President of the Miller County Historical Society museum. 2008. Memories of that Mountain Music! Edna Florence Thimes (1914-1995). Missionary Nurse. Evangelist. Edna was born to Henry J. and Martha (Son) Thimes on September 26, 1914, fourth child of five, in a loving, but unchurched family. They lived on a farm near Emporia, Kansas. Henry and Martha taught the children high moral standards and a reverence for God. Edna was fourteen when she first attended a Church of God congregation and was saved within two months. After graduating from high school, she attended Anderson College, Anderson, Indiana, graduating in 1940 with a Bachelor of Theology. She trained to be a registered home nurse at the St. John’s Hospital School of Nursing at Anderson and at the former Bethany Hospital in Kansas City, Kansas. She served as a Sunday School teacher and Superintendent in her home church and spent her vacations as a resident nurse at the Anderson Church of God campmeeting. Edna served in the mission field in Kenya, East Africa for 22 years at the Mwihila Hospital at Kisumu and in Kima. She once said that half the babies born in Kenya were named “Edna” in her honor. Her special interest were babies whose mothers had died in childbirth. She often kept them until they were two, sharing the love of Jesus with them and returning them to their fathers when they could eat regular table food. When Edna retired from the mission field, she returned to her home in the United States, next moving for a time to California to live near a niece, and finally returning to Kansas City. Edna’s big heart gave out on June 22, 1995. Her “heavenly graduation ceremony” was conducted at the former First Church of God and her body is buried in Emporia. * Near the time of my birth, the ladies at church, including Edna, had a baby shower for my mother, presenting her with a hooded baby towel embroidered with their signatures. We considered her family, as she shared an Uncle William and Aunt Lillian with my mother's maternal Aunt Nadine. Furloughs from the mission field were five years apart and she stayed with us or my grandparents during her deputation visits to churches nearby. I corresponded with her during my teen years and once sent her $5.00 out of my allowance. She wrote a thank you note, stating she had purchased an apple as a treat in the local market. Apples didn’t grow in the climate there and she had been hankering for a taste of home. My mother played the organ for Edna’s funeral service. She’s rejoicing in heaven! 2. Church of God Missions Magazines, various issues from 1961-1978. Places to visit in KS. 2. Bethany Methodist Hospital (org. 1892) stood at the corner of 12th & Reynolds, Kansas City, KS until July 2001 when it closed. Stand at that corner and imagine all the babies born there! 3. Providence Hospital's Medical Museum in the Main Entrance Lobby. (Contains two cabinets of Bethany Hospital & Nursing School memorabilia. ), 8929 Parallel, Kansas City, KS. I'm a sentimental romantic with a degree: "MRS." in domestic engineering, am a former Sunday School teacher and homeschooled our special needs son, now a 30-ish young man. I'm currently researching my 3rd great-grandfather but love to explore my other interests as well. * The content and links on this blog are subject to the owner's discretion. I do not receive payment for endorsing them. * There is no guarantee that posts will be added to this blog within a specific time frame. Research takes time and is subject to information availability. * The biographies are as accurate as possible, but they are only as good as the records I was able to obtain during research. * There are NO Ghosts here, except the Holy Ghost! * If you use information from this website for a school report or for your online family tree, please cite my blog as your source. * Please do not submit multiple comments with a link to your site. * Keep your comments pertinent to the person I've written about. * If your comment submission is deemed inappropriate in any way, it will be deleted immediately! * This blog owner refuses to publish ANONYMOUS comments. * Good manners benefits everyone! * Check the National Weather Service before venturing out to prevent tragedies. Tell someone where you are heading to. * Follow signage. It's there to inform you and for your protection. * Tidy up after yourself and deposit trash in the proper waste receptacle. * Remove only what you brought in with you. Do not take souvenirs (exception: photos); purchase them at the site's gift shop, if you must have one. They fund the care of the site with your dollars. * Plant a tree in honor of someone! * Add me to your planner and come back to read at your convenience. Thank you. 1886 = Kansas City, KS. 1890 = US frontier closed. 1762 = Seven Years’ War. 1776 = July 4. US. Birthday! 1808 = Mo. Gazette; Fort Osage. AGS (Association for Gravestone Studies) NEW! 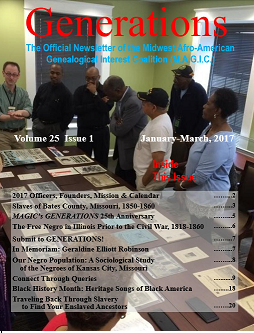 "Missouri Contributors to National Women's Magazines"
a newsletter of the Afro-American genealogy group M.A.G.I.C.